Smashing Sandtown-Winchester to save it? How Baltimore is reacting to Gov. Hogan’s $700 million plan to redevelop West Baltimore – after first demolishing large swaths of it. Reaction to the nearly $700 million West Baltimore redevelopment plan announced yesterday by Gov. Larry Hogan – including the demolition of about 4,000 properties over four years – was decidedly mixed. Would it lift up struggling communities by eliminating blight? Or simply push out poor, African-American longtime residents, leaving vacant lots and lucrative opportunities for demolition contractors, developers and speculators? 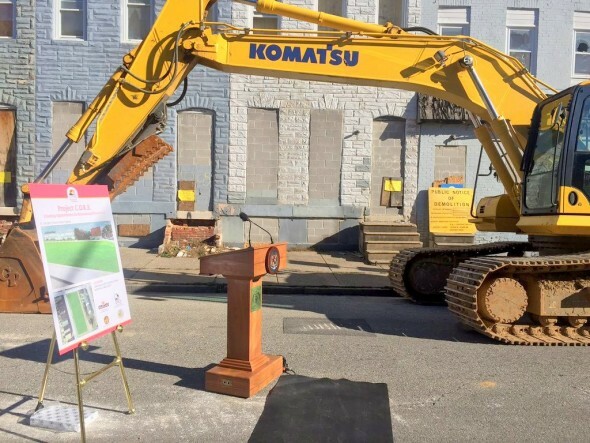 This debate was taking place all over town yesterday after Hogan and Mayor Stephanie Rawlings-Blake announced the plan – and then watched workers claw down a vacant rowhouse in the 1000 block of North Stricker street, a few blocks from where Freddie Gray was arrested last April. “More programs to knock down vacant houses and build ones nobody in the community can afford… Y’all bout to witness gentrification at its finest. Smh,” wrote Justin Green on her Facebook page. “I agree that gentrification is an important issue but these are vacants. . . they need to be razed,” Quincey Gamble responded. “Yes, both the mayor and governor released information that a relocation program is in place in conjunction with this plan,” observed Jorge Mendez. “Trust me, the developers/investors will get first dibs. . . after that, it’s a wrap. We seen this too many times before,” Green shot back, going on to recount the story of her grandparents’ relocation from a house located in town. Under the Hogan Administration plan, dubbed Project CORE (Creating Opportunities for Renewal and Enterprise), about $75 million in state aid will go to demolition over four years with the city contributing another $19 million in “in-kind administrative services,” according to a news release. The state estimates that approximately twenty city blocks can be completely cleared of blight in the first year, with the initial block to fall being 1000 block of North Stricker. The Maryland Stadium Authority will oversee demolition projects jointly approved by the state and city. An additional $600 million, through the Department of Housing and Community Development, was promised for redevelopment subsidies, including more than $150 million in 2016. “Financing for quality development projects will be made over the next four years through a range of innovative programs and partnerships, including the Rental Assistance Demonstration program and the issuance of potentially $200 million in revenue bonds,” according to a release from Hogan’s office. State housing officials said the subsidies would go toward retail development and affordable, as well as market rate, housing. Spending under the program is subject to approval by the City Council and the Maryland General Assembly. Rawlings-Blake praised Hogan and said she had confidence that the project would be well-managed, noting that the Stadium Authority is also managing the city school reconstruction initiative. Officials said some of the redevelopment opportunities for the razed properties would be offered through the Mayor’s Vacants to Value Program, an initiative singled out last year by a foundation report for exaggerating its modest accomplishments. Depending on how they are defined, Baltimore’s stock of vacant houses stands roughly at either 16,000 or more than 40,000. The city says it has completed or begun demolition on 2,500 of them since V2V began five years ago. City-state relations remain volatile in Baltimore, with the image still fresh of armed National Guardsmen patrolling Baltimore streets in the unrest following Gray’s in-custody death and Hogan’s decision in June to kill the long-planned Red Line light rail project. 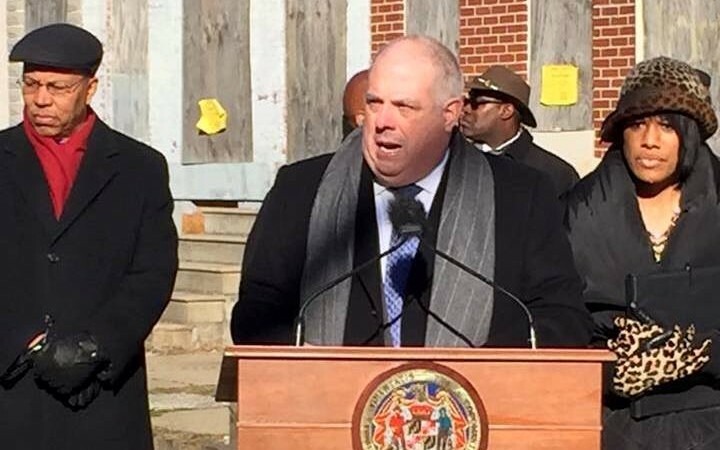 Hogan said his redevelopment initiative is the remedy citizens were told him they wanted in the aftermath of the April rioting. Both city and state leaders will have to combat widespread cynicism from across the political spectrum as they push the plan forward against decades of disinvestment, racially divisive housing policies and projects such the demolition along the Route 40 corridor that displaced thousands and resulted in the so-called Highway to Nowhere. Commenting on Facebook yesterday, Carol Ott, director of Housing Policy Watch, said she has “very serious concerns” about the plan. “Who will be receiving the money? What kind of accountability is in place to ensure it’s spent wisely, and on actual work that benefits residents, and not ‘studies’ or the like?” wrote Ott, who has focused on the issue of blighted, slumlord-owned housing for years. Echoing her was Raymond A. Winbush, director of the Institute for Urban Research at Morgan State University. But Ferguson said this help from Annapolis would benefit Baltimore residents. “This is a great start for new investment in the City, and the bipartisan support from the Governor makes a big difference,” Ferguson said to his Facebook followers. Others, meanwhile, questioned the destruction of Baltimore’s old housing stock and said the Red Line project would have been a better way to uplift struggling West Baltimore. “We’re tearing down quality historic structures that could be rehabbed leaving empty fields that may or may not eventually be developed with likely low-quality dime-a-dozen stick-built buildings that will fall apart in 30 years,” wrote Jed Weeks, of the advocacy group Bikemore. “But hey I guess let’s celebrate $700 million to tear down our city instead of $700 million for transit infrastructure that could have led to reinvestment in existing structures,” he concluded. “Yes, we need to deal with blighted properties,” said Parker, a city council candidate seeking to represent Southeast Baltimore’s 1st District. “But blighted properties don’t cause the deterioration of the neighborhood. Parker said he was troubled by Hogan’s phrasing yesterday. In the end, Parker concluded his comments on a hopeful note.